Peace! 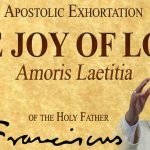 The Apostolic Administrator, Most Rev. 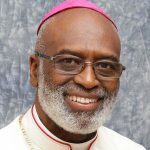 Charles G. Palmer-Buckle, recently made the following appointments and transfers in the Catholic Archdiocese of Accra. Peace! 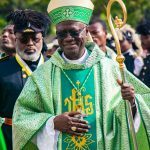 His Holiness Pope Francis has accepted the resignation of His Grace Archbishop Matthias Nketsiah of Cape Coast and has appointed His Grace Most Rev. 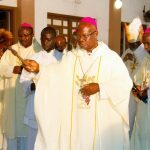 Charles Palmer-Buckle as the new Archbishop of the Archdiocese of Cape Coast. 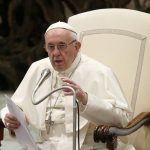 The news was released in a Press Communique from the Apostolic Nunciature by His Excellency Most Rev. 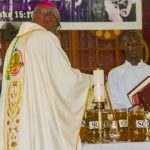 Jean Marie Speich, the Apostolic Nuncio on Friday, 11th May 2018 and announced at the National Catholic Secretariat by Very Rev. Fr. Lazarus Anondee, the Secretary General. The official Press Communique is attached below. This announcement is to be made by the priest himself in all parishes/churches throughout the entire Archdiocese of Accra tomorrow, Sunday, 13th May 2018 at all Masses. Let us pray for Archbishop Charles Palmer-Buckle. 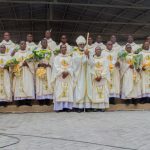 Let us pray for the Catholic Archdiocese of Accra. May God bless us and guide us in the days ahead. Amen. The Appointments are effective November 01, 2017. We congratulate our brothers on their First Appointments and wish them the guidance of the Holy Spirit in their pastoral ministry. May Mary our Mother and Patroness of our Archdiocese also intercede for them. Amen. 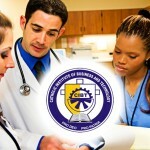 The Catholic Institute of Business and Technology (CIBT) will soon begin admissions for BSc. Physician Assistantship. The new programme will be affiliated to the University of Cape Coast (UCC). Watch out for admission forms soon. Call: 0208241315 / 0205 4955 89 / 0307-033-547. ANNOUNCEMENT IN VIEW OF GHANA’S 60TH INDEPENDENCE ANNIVERSARY AND 40TH ANNIVERSARY OF DIPLOMATIC RELATIONS BETWEEN THE HOLY SEE AND THE REPUBLIC OF GHANA. 1. NOVENA TO THE MOST SACRED HEART OF JESUS AND THE IMMACULATE HEART OF MARY FROM THURSDAY, FEBRUARY 25 TO FRIDAY, MARCH 03, 2017. 2. OBSERVATION OF FIRST FRIDAY DEVOTION TO THE MOST SACRED HEART OF JESUS ON FRIDAY, MARCH 03, 2017 (WITH ALL-DAY EXPOSITION OF THE BLESSED SACRAMENT IN PARISH/RECTORATE CHAPELS). 3. CELEBRATION OF FIRST SATURDAY DEVOTION AND HOLY MASS IN HONOUR OF THE IMMACULATE HEART OF MARY, MOTHER OF CHRIST IN THE MORNING IN VARIOUS PARISHES AND RECTORATES ON SATURDAY, MARCH 04, 2017. 5. THE RE-CONSECRATION OF GHANA TO THE MOST SACRED HEART OF JESUS IN AN ECUMENICAL AND INTER-FAITH PRAYER SERVICE (FIRST LENTEN VESPERS) AT THE HOLY SPIRIT CATHEDRAL, ACCRA, ON SATURDAY, MARCH 04, 2017 FROM 17.00 TO 18:30 GMT TO BE PRESIDED OVER BY THE APOSTOLIC NUNCIO AND THE PRESIDENT OF THE GHANA CATHOLIC BISHOPS? CONFERENCE TOGETHER WITH OTHER BISHOPS WITH THE PARTICIPATION OF OTHER DIGNATARIES. 6. 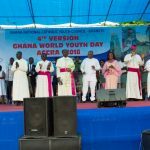 ON SUNDAY, MARCH 05, 2017, THERE WILL BE HOLY MASS OF THANKSGIVING FOR BOTH THE 40TH ANNIVERSARY OF DIPLOMATIC RELATIONS BETWEEN GHANA AND THE HOLY SEE (VATICAN CITY) AND THE 60TH ANNIVERARY OF GHANA?S INDEPENDENCE AT THE HOLY SPIRIT CATHEDRAL, ACCRA. 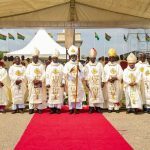 The Metropolitan Archbishop of Accra encourages all to participate in these spiritual exercises and celebrations as our prayerful contribution to God in thanksgiving for the 40th Anniversary of the Apostolic Nunciature and for the 60th of Ghana?s Independence. Further directives will be given in due course. 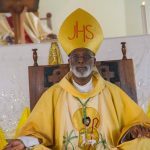 Given on Saturday, February 04, 2017 to be announced at the Grottoes and in the Parishes/Rectorates and Religious Houses today and tomorrow, Sunday, February 05, 2017 and thereafter. After a long period of inactivity, we are pleased to inform you that the Accra Catholic Leadership Roundtable (ACLR) website has been ‘resurrected’. After long inaction and with the dissipation of the high hopes and expectations that we all had when His Grace Archbishop Charles G. Palmer Buckle, the Metropolitan Archbishop of Accra launched the ACLR, we are happy to relaunch the site with new and exciting prospects that we hope will enkindle your fervent desire to be of service not only to the Catholic Archdiocese of Accra but also to the entire Ghana Catholic Bishops Conference (GCBC) and mother Ghana. Please visit the website www.aclr153.com to find out what’s new and sign up as a member and to receive our newsletters. ACLR is ready to engage your expertise to be service to the Church and to Ghana. 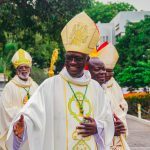 In response to Pope Francis’ Climate Encyclical ‘Laudato Si’ of 2015, the GCBC is inviting inputs as to how the Church in Ghana can effectively engage in the national efforts to take care of our God-given environment. Feel free to send an e-mail to info@aclr153.com with your inputs. The GCBC is also seeking ways to enable its Component parts, Parishes, Out stations, Seminaries, Schools, Hospitals, Charity homes and the like to make use of solar energy, which is more environmentally friendly. At the same time, Caritas Ghana (the Charity Organization of the GCBC and member of the global Caritas Confederation) is preparing to launch an E-waste collection and recycling venture. This will involve the safe collection, packaging and transportation of initially and end of life cycle mobile phone batteries and old mobile phones. Details will be communicated to you later. Can we please remind ourselves how we disposed of our last mobile phone battery when it went dead? The ‘‘Bloggers area’’ will soon be opened to the various professional guilds to share issues of interest from their areas of work. We hope you start getting your write-ups ready. New members are also invited. There will be NO WAKE-KEEPING. On Saturday, 4th JUNE, 2016 at 4:00 am, the body will be laid in state in his residence at Taifa near the Pentecost church. Interment will be at Achimota Cemetery, then back to the St John Fisher church grounds for the final funeral rites. Sunday 5th JUNE, 2016 at the 9:30 am Mass there will be Thanksgiving . Thereafter family and friends will gather at the Church premises (St. John Fisher Catholic Church at Achimota). Please let us continue to pray for the soul of the deceased and for the bereaved family at our Masses. That scrutiny of employees (Guards) shall include a guarantee from their respective Parish Pastoral Councils (P.P.C). There shall be due diligence on prospective employees (Guards) to avoid recruiting criminals. To assure all and sundry that we would live up to the tenets of Catholicism, viz. dignity, equal opportunity and integrity, to mention a few. That we are passionate about helping you build the security you will need on all fronts to prevent criminals’ attempts that will hamper your peace and safety. That in our world you always come first in the scheme of affairs. That is why our services will be tailored to meet your every need from strategic to normal security services. Whatever your dreams and aspirations, we will partner you to build the security you have always desired. That employees (Guards) would be taken through Para Military training, will be well motivated to become a passionate staff that see our clients as themselves. We know our success depends on the happiness and satisfaction of our clients!!! Advertisement towards recruitment of employees (Guards) would be published in the Catholic Standard and on Catholic Digest. Peace! 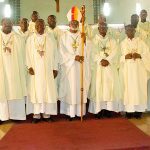 The Archbishop, over the weekend, elevated St. George Catholic Church, Police Depot (Tesano) to a full Chaplaincy status; equivalent to a Parish. St. George Chaplaincy thus becomes the 36th canonically erected “parish” in the Archdiocese. Though equivalent to a parish, due to its unique location, it will still be referred to as “Chaplaincy”. Subsequently, the Archbishop has also installed Very Rev. Fr. George Arthur (ACP), as Chaplain with the full faculties of a Parish Priest. Peace! We regret to announce the death of Mr. Thomas Acheampong which occurred this morning 14th April, 2016. He was the father of Rev. Fr. Fred Agyeman, a priest of this Archdiocese now working as Chaplain to the Ghanaian Community in the Archdiocese of New York, US. Burial and funeral arrangements will be announced later. Meanwhile, let us offer Masses and our community prayers for the repose of the soul of the deceased and for the bereaved family.